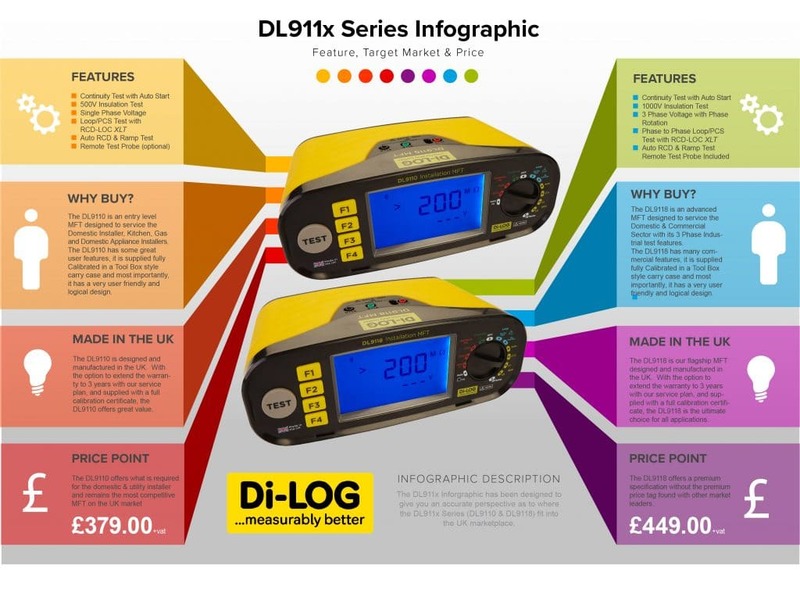 Di-Log frequently asked questions and special offers. What Multifunction Tester should I choose? An instrument from the DL911x Series MFT of course! Choosing the correct 18th Edition Multifunction tester is just one of the most important decisions you would need to make as an Electrician. The DL911x Series of MFT offer the user the choice to select which instruments suits their requirment and application. Have a look at out infographic below to help you select the right Multifunction Tester for you. Continuity testing on the DL9118 18th Edition MFT is very simple. The test requires the Red and Black leads to be plugged directly in to the input terminals at the top of the instrument, you will see that the terminals are clearly coloured Red & Black. Rotate the rotary dial anti clockwise to position 1. Using the correct safety equipment and qualification, remove the GS38 protective shrouds then connect the crocodile clips on to the the end of the red and black probes. With the instrument already Auto Null’d or Zero’d (Click here to watch the video on how to Auto Null your Test Leads), press the function 4 button (F4) and you will see the Auto symbol illuminate on the screen. The instrument is now set and will automatically start when it is connected to a resistive value. The DL9118 is fitted with a fully automated electronic protection system, which continuously monitors for voltage being present on any conductor. If there is any voltage in excess of 50V TRMS, the instrument will alarm, the screen will change to red and the voltage will be indicated on the screen. To have a look at how this feature works, watch our new DL9118 in motion. Three Phase Voltage Measurement on the DL9118 18th Edition MFT is very simple. The test requires all three leads to be plugged directly in to the input terminal at the top of the instrument, you will see that the terminals are clearly labeled L1 (Red), L2 (Green) & L3 (Black). Rotate the rotary dial anti clockwise the the “Volts” position. Using the correct safety equipment and qualification, connect the probes directly to the corresponding phase making sure L1 matches L1, L2 matches L2 and so on. Within seconds, the 3 phase voltage measurement is indicated on the screen of the DL9118. The 3 phase voltage measurement also includes a Phase Sequencer, which will also indicate if the phases are phased in the correct order, and subsequently will indicate how to correct incorrect phasing. The Di-log DL9118 has a NEW (Patent pending) method of performing a very accurate low current Earth Fault Loop Impedance measurement Zs, RCD-LOC XLT (Expert Loop Technology). RCD-LOC XLT has a unique patented noise interference and RCD uplift sensing technology which specifically looks for any characteristic which could effect the accuracy of your earth loop reading at low current. To have a look at how this feature works, watch our now technology in motion. My Loop Zs result should match my calculated, Ze+(R1+R2) value? There are a lot of factors why the measured Zs results will always be higher than the calculated result, especially when an RCD is fitted for protection. Technology and IT equipment is evermore increasing in our homes and offices, creating distorted waveforms due to noise on the relevant circuits. Although manufacturers are continuously developing new methods to overcome some issues, this issue will never be eradicated. More commonly, electricians can experience RCD uplift, RDC coils are becoming ever more inductive as the market growth is driving the price of components down. Commonly, your loop measurement will always be higher due to the different method each manufacturer used to measure Earth Loop Impedance. 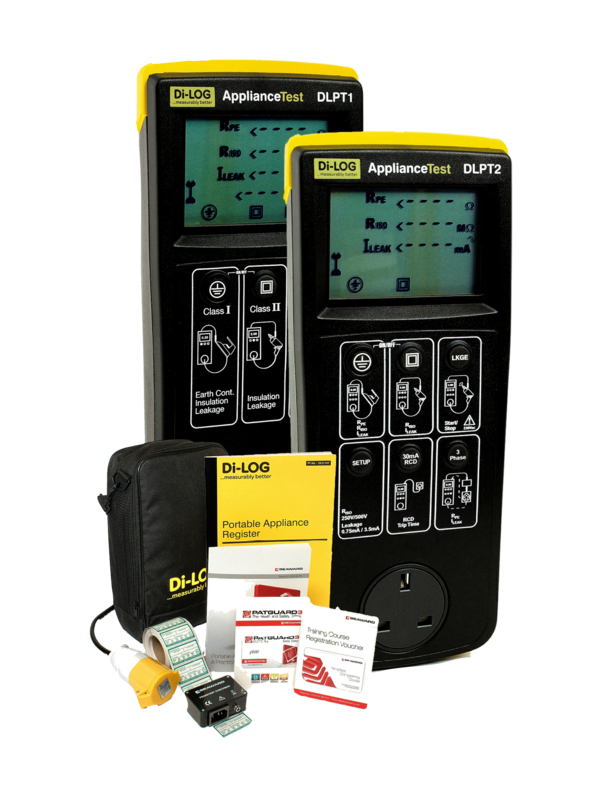 Di-log’s new low current ‘Expert Loop Technology’ RCD-LOC XLT has been 5 years in development and has now been proven to be the most accurate method to test Earth Fault Loop Impedance in a circuit which is protected be an RCD or RCBO. The RCD-LOC XLT feature is fitted in our NEW DL9118 17th Edition Multifuction Tester, click here for more information. Check Boxes were more commonly introduced 2005 when Part-P was launched. The periodic meter checking process was introduced as an additional check to coincide with your annual calibration. We frequently come across electricians that have been miss fed this information by their local inspector, they may well be happy for you not to regularly calibrate your meter, but what does your liability insurance say? The guide line for all monitoring bodies is quoted to be ‘As per the manufacturer’s recommendation’ which is every year. You may well have come across a situation where your tester inhibited your test button, indicating that the contact voltage is >50V. This is a safety feature that was made mandatory when 17th edition was introduced. The RCD tester will sense if there is excessive voltage between Neutral and PE, and by injecting, for example, injecting 150mA leakage in to a 30mA RCD ( 5 x current) this could create a dangerous voltage on the earth above the safe limit of 50v. All Insulation/Continuity Testers must be protected if mains voltage is applied to either the Insulation or Continuity Test. The applied voltage needs to be indicated, and the test button will then be inhibited. This safety feature is vital for the requirement of IEC61557 and worth checking that this feature applies to your tester. My continuity readings continuously reading zero when measuring R1 + R2, My meter may not necessarily be faulty? Regularly zeroing your leads is now deemed common practice as part of your periodic checking and risk assessment protocol, with a lot of electricians expecting their leads to last the life of their test equipment. Test leads are a wear and tear items, commonly, subject to lots of stress in arduous environments with the crocodile clips deteriorating over time. The spring that connects the top toothed track to the bottom track can breakdown, causing the top track to be more resistive than the bottom. This issue really only becomes an issue if you zero your leads using the top tracks of each crocodile clip, greatly increasing your lead resistance. 17th Edition requires your meter to inject a current >200mA to be fully conformant to IEC61557-4. Fundamentally, by injecting a larger current into a single strand cable, this greatly improves accuracy and could identify cables with poor termination. Depending on your manufacturer, each test instrument performs its own patented method to achieve a set result, especially in the case of Earth Loop Impedance. Factors that can vary, would be test current, voltage type and even frequency. Every manufacturer will try and achieve the same result, in a completely different way, with the usual effects of noise, RCD’s and interference.